Interested in purchasing the Master Your Money Super Bundle? I spent hours going through all of the resources in the bundle and I am sharing my completely honest review with you, including what I liked and what I didn’t like. Should You Purchase the Master Your Money Bundle? If you have been considering buying the Master Your Money Super Bundle, I am here to provide you with a completely honest and biased review. I say biased because we all have bias. Which means that you are free to agree or disagree with my conclusions. But I want to share this honest review of the Master Your Money Super Bundle for those of you who are on the fence as to whether it is worth purchasing or not. So many of you loved my honest review of The Ultimate Productivity Toolkit and begged me to do honest reviews for each of the bundles from Ultimate Bundles. While it takes a lot of time and effort to go through each and every product in a bundle, because I love to help you spend your money wisely, I am happy to prioritize the time to do so. First off, I need you to know that I did use my affiliate links throughout this post. I am an affiliate for the Ultimate Bundles this time around, not a contributor. A contributor is someone who has included a product of their own in the bundle. As a thank you for the time and effort that you put into creating your product and allowing it to be part of the bundle, Ultimate Bundles pays you 70% of every sale made through your link. They also split a small percentage of the overall sales amongst all contributors. (This is usually a few hundred dollars or less). I have been a contributor to other bundles in the past (and will likely be one in the future!) I love the folks at Ultimate Bundles and love their heart for what they do. 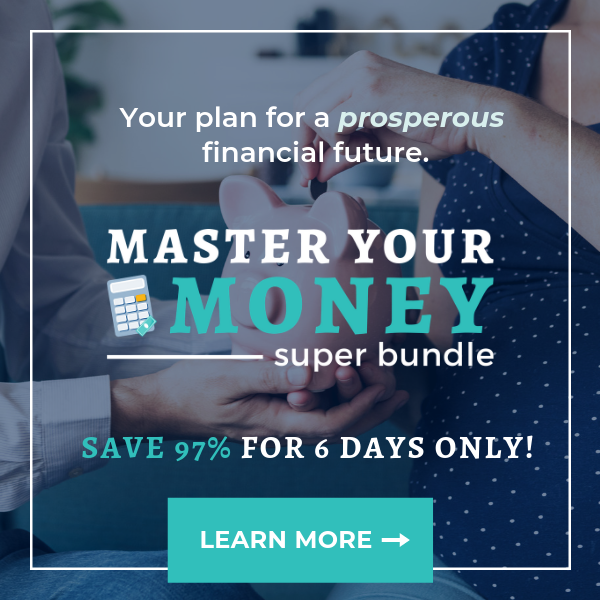 However, when they approached me about being one for this bundle, I decided against it because I felt that the price point of $49.97 was a little on the high side for my audience — especially since this bundle was on the topic of saving and investing money. I am typically only a contributor for a bundle if I feel like it is going to be a really, really good fit for my audience and something that you all will be super excited about. I just felt like many of you would not be excited about a bundle on money that cost $49.97, so I decided to decline the opportunity. Instead of being a contributor, I am an affiliate, which means I earn 40% of every sale through my link. I just wanted to put that out here in full disclosure. If you click through any of the links in this post and purchase the bundle, I will earn 40% of the sale. I spent hours going through every single ebook, video, and course in the bundle in order to bring you the most thorough and honest review that I can. Again, I’m biased, so please know you can wholeheartedly disagree with me. But whether you agree with my assessment of the bundle or not, I hope this is helpful to you as you think through whether purchasing the Master Your Money Super Bundle is worth it for you! Some of the products had an inflated price tag. I will say that I felt like many of the prices on the products in the Master Your Money Super Bundle were very realistic and fair for the value, I felt like most of the videos that had a value of $19 weren’t really a $19 value and about 5 other products in the bundle felt over-priced to me. With this in mind, even though they say the bundle is a $1200 value, I’d say that for the products I would use and felt were worth what they were priced at, to me the value would be more like $350 to $400 maximum. Some of the products were poorly designed. I know that we don’t always have the highest quality design on things we offer because of various reasons and I know sometimes you just do the best you can do, but I found that at least 30% of the ebooks were poorly designed and hard to read. I know that “content is king”, but if your ebook is hard on my eyes and unprofessional, it makes it a lot harder to really enjoy soaking up the wisdom in the content. There is quite a bit of overlap. I don’t think this is necessarily a bad thing as we need to hear things more than once and different people are going to resonate with different types of teaching styles, but for some people, the fact that there is quite a bit of overlap — especially in the areas of learning to budget and cutting expenses — could de-value this bundle. I loved that there were so many different aspects of money management covered. This bundle covers everything from investing to paying off debt to how to make more money to ways to practically cut expenses to starting a side hustle to retirement. The bundle was very comprehensive and had a lot of valuable resources with actionable tips. Most of the products were more by everyday people instead of professionals. While some people would prefer to only get financial advice from certified professionals, I prefer to learn from people who aren’t just talking in theory, but who have actually lived what they are teaching (not to say that all professionals haven’t experienced some of what they share, but I think you understand what I mean). Instead of a theory on how to pay down debt, I much prefer to hear your story of how you actually did it. There’s a lot of that in the resources in this bundle and it makes it feel very accessible and doable. 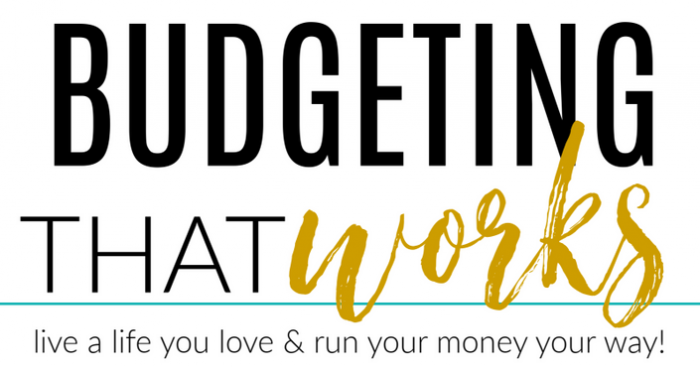 Budgeting That Works — I love Caroline’s style of teaching and she breaks everything down step-by-step. She also has a great voice on audio that is interesting to listen to. In this course, she gives you the tools you need to really set up a budget and follow through with it. She comes across as a fun cheerleader. I loved her 30-7-30 rule that she outlines and she has some great printables at the end of the course, including a 160 Ways to Save Cheatsheet which I thought was very valuable. Marriage & Money Bundle — This was a beautifully put together series of workbooks that had so many different valuable ideas and encouragement to help you get on the same page with your spouse when it comes to your finances. 30-Day Money-Saving Challenge — Looking for someone to give you some really actionable and simple ways to cut your expenses so you can save more money? I loved this 30-day download that offered a realistic and doable money-saving project for each day… and it could add up to a lot of savings over the course of the 30 days and beyond! 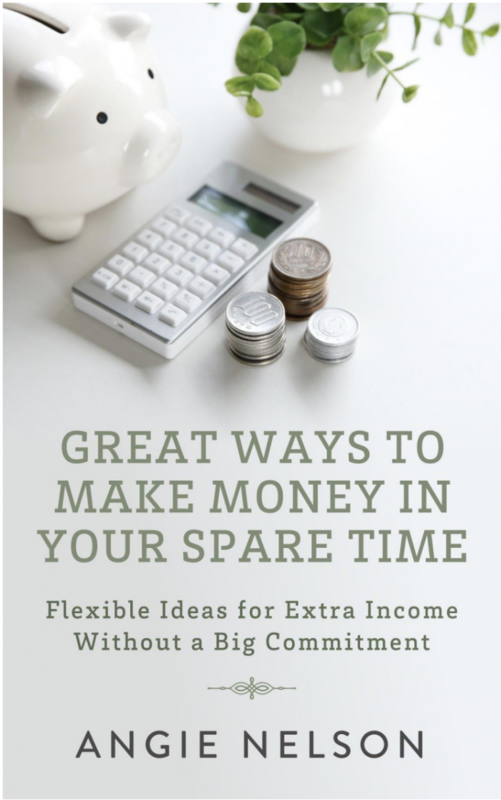 Great Ways to Make Money in Your Spare Time — I’m constantly on the lookout for ways moms can make some extra money in little pockets of extra time they have throughout the week. This book had so many fantastic ideas — and many were ones I had never heard of before. This ebook alone could help you make back the cost of the bundle in just a day or two! Side Hustle Starter Kit — If you are thinking of starting a side business, this is a valuable resource to go through. It walks you through everything you need to think through, plan for, and prioritize as a brand-new business owner. I also feel that going through this could help you prevent a lot of mistakes upfront. How to Be Frugal: A Guided 10 Unit Course That Will Teach You How to Be Frugal Online, In the Store, and In Your Home — I have gotten to know Jennifer online a little in the last few years and truly loved this course of hers. Jennifer is a mom of 7 and she knows her stuff! She makes you feel like you are just sitting with her in her living room with her and she’s downloading all of her hard-won money-saving tips and tricks to you. Definitely worth your while to sign up for this one — and if this is the only course you go through, this one alone might make the $49.97 price tag worth it. Click here to order the Master Your Money Super Bundle for $49.97! P.S. Any questions on anything about the Master Your Money Super Bundle? Leave a comment and I’ll do my best to help answer it! I want to make sure you only invest your money in something that is truly going to make a difference in your life! Looking for more? Read more posts about Honest Product Reviews. Loved your review of the bundle. I’m looking to reading more reviews in the future! Thank you for your encouragement and thanks so much for being such a longtime follower! I, too, appreciate your honesty and all the time you put into providing a through review of the bundle. Thank you so much, Crystal. I think I am going to look into this bundle a little more. I agree that I would be more interested in getting the ideas and advice from professionals. Are there any resources on saving for retirement? There’s one ebook specifically on retirement and then some of the courses touch on it, as well. I always wondered how the finance part of the bundle worked. Thanks for sharing. The resource on marriage and money sounds like a good one! This was a very helpful review; thank you! I appreciate reading the honest feedback. I think you went to a lot of trouble to organize this bundle. I appreciate all the work you have done weeding out the ebooks that are not of the best contents and not written to hold my attention. I do not want to waste my money reading something that repeats its self a lot or gives me information that is so simple I already know it. I want to learn something I have never thought of before or tried. I am going to buy this bundle in hopes of finding these things. Thank you.